Technical conferences and meetings have a strong tradition of food/beer/wine/etc. But how about music? Lots of math and C.S. types are into music too, and it's a shame to waste an opportunity to jam when we're in the same place. Ian Jacobs introduced DanConnolly, co-chair of the new HTML Working Group, noting that the chair's job works best when everybody plays their part. Dan dedicated the opening number to Sam Ruby for reminding him about Lawrence Lessig at OSCON 2002 (flash video) and to Aaron Swartz for great collaborations. Dan said this concert his answer to the sound of Lessig's voice echoing his head: what have you done about it?. Then he dedicated the next number, The Gambler to Mark Manasse for bringing Why Rights Management is Wrong (and What to Do Instead) to Sophia-Antipolis for the W3C DRM Workshp in 2000, saying we're going to be doing some of it today. Then next number, Teach Your Children Well was dedicated to Brennan, Justin, Kyle, Michael, Andrew, and Ben. Voices broke as singers remembers their parents and children back home. to Simon; I love you, man! Drop a little something in the W3C tip jar or under Dan's family tree if you'd like to help the band find time to do more gigs/podcasts. 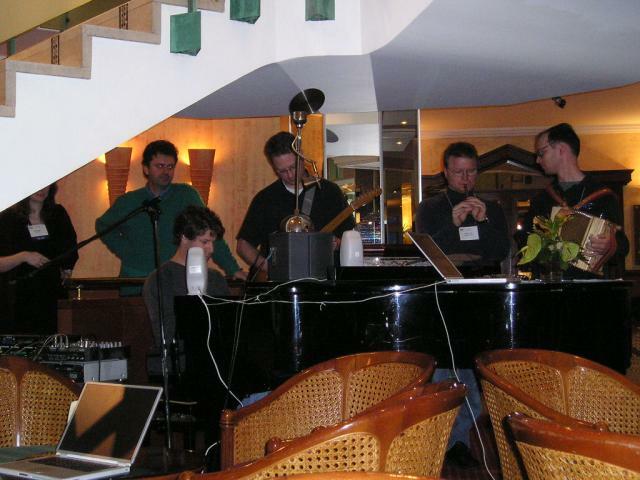 IanJacobs on keyboards, DanConnolly on guitar, JonathanRobie on pennywhistle, and JoseKahan on accordian at the Royal Casino hotel in France, March 2004. (among Jacek Kopecky's TP photos) see also: libby's photos of 2Mar. This page was last modified on 14 November 2007, at 22:02.